Critical thinking is a metacognitive skill, or what is generally known as 'thinking about thinking' (Howard et al. 2014). Critical thinking is a general competence that comprises several sub-skills (e.g., inferencing, deducing, interpreting, synthesizing, conceptualizing, evaluating, creating, and analyzing). While it is a higher order form of thinking, critical thinking is much more than the ability to think in a complex and sophisticated way. It is rather using these complex thinking processes to deconstruct, analyze and ultimately make informed decisions (e.g., stances, assumptions, viewpoints…etc). According to Nicoteri (1998), “ Critical thinking involves identifying the problem, assessing your resources, and generating possible solutions. This allows you to decide which solution is the most reasonable under the circumstances, taking into consideration the "what ifs" and how they will affect the end result. If you can only see one solution, you're setting yourself up for failure” (pp. 64-65). Following Howard et al’s (2014) conceptualization, we highlight three main cognitive skills (analyzing, evaluating, and creating) as being intricately related to the development of critical thinking skills. These skills are also part of Bloom’s revised taxonomy (Anderson and Krathwohl, 2001). For each of these skills we came up with a collection of iPad apps students can use to realize it. The focus is on the process and not end product. Produce compelling short video stories. Create, edit, and share beautiful movies and video clips. Create, edit and share mind maps. 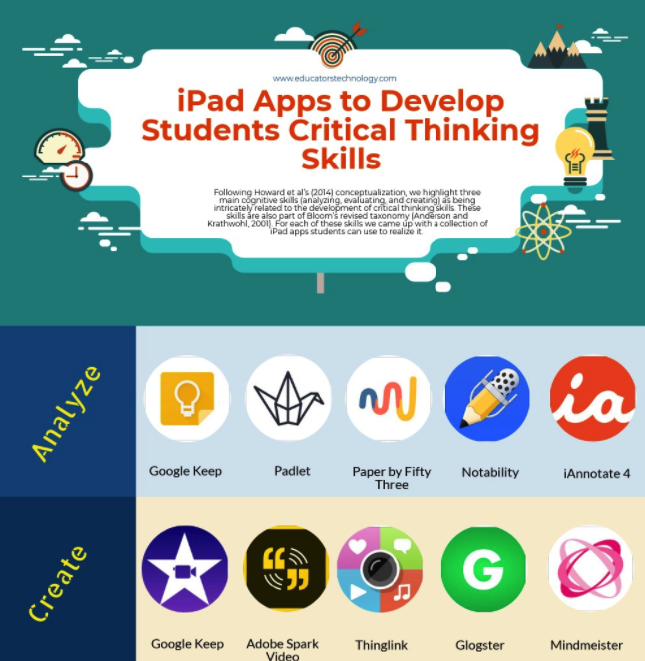 An ideal app for reflecting on learning and for collaborating. Create and share visually illustrated video tutorials. 1- Howard, L., Tang, T., & Austin, J. (2014). Teaching critical thinking skills: ability, motivation, intervention, and the Pygmalion effect. Journal of Business Ethics, 128(1), pp. 133-147. 2- Nicoteri, A. (1998). Critical thinking skills. The American Journal of Nursing, 98(10), pp.62-65.